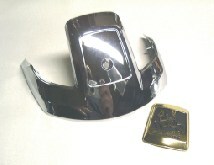 Front Fender Trim - Genuine Suzuki trim for the front fender. Includes chrome trim, rider emblem with self-stick backing and all fasteners for installation. Price does not include shipping. 50 state shipping for this item is about $3. When ordered with other items, shipping cost will be calculated based on the weight of the total order.